Its not too early to book for a March Workshop. A surface design, technique workshop, no sewing. 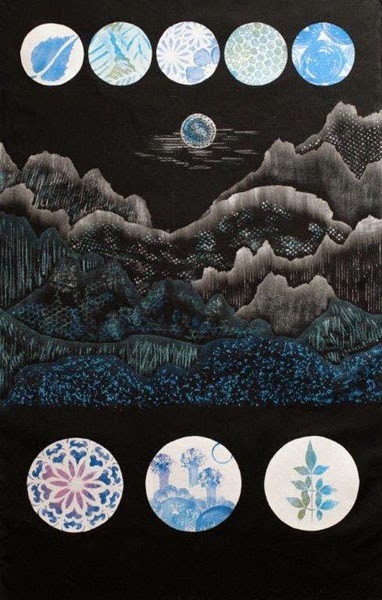 This is an opportunity to explore the exciting surface design techniques of printing and rubbing while creating unique, exclusive fabric with visual texture and pattern. Design, composition and many useful tips on colour mixing, fabric paints and working with low tech everyday items are passed on. Surface decoration has never been easier than under the guidance of experienced tutor Sue Dennis. Download and return a Workshop Booking Form to reserve your place in what will be a very popular workshop. The Quilters' Guild of NSW Inc. invite entries for a juried contemporary quilt exhibition to be held at Hazelhurst Regional Gallery and Arts Centre from 29 August to 8 September 2015. The exhibition is open to quilters and fibre artists from all Australian states and territories. Membership of the Guild is NOT a requirement of entry. There will be two prizes offered, a first prize of $1500 and a viewers' choice prize of $200. Entries must address the title theme Evolution, Change, Challenge: A Contemporary Quilt and measure 70x100cm (WxH) portrait format. Judges will carefully consider the appropriate interpretation of the theme and design concepts applied, particularly the use of colour and value for all quilts entered. Entries via the Online Entry Form only with payment of an entry fee of $25 per quilt. The closing date for entries is 24 July 2015. Proudly sponsored by Pegs Pieces and Patchwork Plus. The Office of the Quilters' Guild of NSW Inc will be unattended from 3pm December 12 2014 until 10am January 12 2015. All postal mail will be kept back by Australia Post. All Library books should be retained until the office re-opens. Please do not leave LIbrary books at the door of the office. Please do not post Library books to 'The Guild'. In conjunction with a meeting to celebrate 25 years of exploring a love of fabric, patchwork and quilting, the Batemans Bay Patchwork and Quilters Guild Inc invite anyone to enter their 2015 Challenge. A 12" x 16" quilt showcasing Silver as the theme can be entered into this competition. The quilt entry deadline for those unable to attend meetings of this guild will be 11 February 2015. Challenge quilts will be on display at the Silver Luncheon of this Guild. Two raffle quilts will provide monies for a Childrens Refuge : The Moruya Oncology Unit, Cassies Place. The Compassion in Action Project have sent The Quilters' Guild of NSW Inc. notification of their upcoming Auction. 'The Guild' helps Judge at this Charity Event, and many sponsors offer prizes. Quilters from many groups were advised of this Challenge some months ago, and have been sewing for this worthy cause. 'The Guild' is always supportive in the Advertising of any event that is not solely Business related. All quilt donations will benefit those less fortunate. Father Chris Riley’s Youth off the Street and Wayback Ltd, for the homeless. “If we all join together we can make a difference in someone’s life. Father Chris Riley’s Youth Off the Street and Wayback Ltd.